A round of drinks for five style bloggers at the Gramercy Park Hotel. I had the great pleasure on Thursday night of meeting up for cocktails with four other blogger friends who I had never met in the flesh before. Lisa Borgnes Giramonti of A Bloomsbury Life was visiting New York City from her home in LA. Lisa and I have been online friends for several years, following each other's blogs, leaving comments, and connecting on Facebook. Likewise the pen-named Reggie Darling and his partner Boy Fenwick who joined the party, as well as Nick Olsen, who is a new friend. Lisa was staying at the apartment of a friend who lives on Gramercy Park so we all met there and then hightailed it across the street to rustle up some drinks at the swanky Gramercy Park Hotel, owned by Ian Schrager and designed in collaboration with Julian Schnabel. After an ill-fated attempt to take the elevator to the roof garden bar which turned out to be closed, we landed on a chic perch in the ground floor Jade Bar on low little stools surrounding a table with one glowing candle. 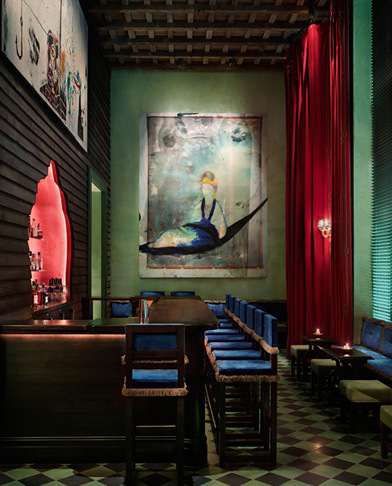 The Jade Bar, photo from the Gramercy Park Hotel. There we had a great time getting to know each other in person. It was funny because we already knew a lot about each other – our families, our homes, what we have been up to for the past couple of years. We talked about the what we like about blogging (the global reach, the opportunity to teach) and what we didn't like (the hours required, the lack of monetary reward). Lisa observed that for the most part we like romantic things that go back in time but that we are using the very modern internet to communicate our point of view. We agreed that blogging helped us to know ourselves better; certainly my blog about style has helped me define my own style. The Infinicam iphone photo app was recommended, we discussed the current second season of Downton Abbey, and talked about the books we are reading (Rules of Civility by Amor Towles, The Guest List by Ethan Mordden, The Love of Erika Ewald by Stefan Zweig). It was fun to be with others who share a similar viewpoint about aesthetics and manners and art, and the internet had already connected us. Soon our time together was over. We dispersed our separate ways but we can always meet again online. I rode my red Raleigh bicycle home around dark, historic, nineteenth-century Gramercy Park. What fun to meet up with people you feel you already know and without any one of you under the stress of entertaining or cooking. I'll bet the hours flew by! Forgive me, Bart, but I don't know what "I rode the Red Raleigh home around Gramercy Park." means? Is that a horse-drawn carriage? Hi Reggie, I look forward to that! Oh no! I was in town as well and would have loved to join in. Glad to hear you had a ball! Hope to meet you next time I am in NYC! Meg, would love to meet! Ah, a civilized New York evening - a much-missed phenomenon for anyone who's moved away. Deep envy and all that. What joy to connect in person with people, as you note, whom you already in a sense know so well. I've recently resurrected my own blog just because I was missing both the opportunity to say/write things that everyday life doesn't present much opportunity for, and because of how much, previously (and now again) I enjoyed that sense of virtual camaraderie. And while perhaps my blood has thinned after years in Middle East, isn't February a little chilly for the Red Raleigh? My phone is downloading the Infinicam app as I write this. Thanks for the tip!